I have been reflecting recently on the book, Reading Reconsidered, by Doug Lemov, Colleen Driggs, and Erica Woolway. I have already blogged on how I used techniques of paraphrasing and summary I learned in the book, today I want to discuss revision, a tool that has grown in importance for me in the past six months. Last October I got a chance to meet the author, Lauren Groff, at the Southern Festival of Books in Nashville. I wanted a chance to hear from the author of Arcadia, one of my favorite books of the past ten years, and I wanted autograph for my copy of her newest book, Fates & Furies. I have learned in my experience at SFoB that the best place in the autograph line is at the end. That's where you get to ask the most questions and have the best interactions with the authors. I lingered on War Memorial Plaza, thinking about the presentation she had just given. One highlight of her talk was her description of writing Fates & Furies. "I began with a story," she said, "and then I wrote it again and again." As she spoke, her left hand held an imaginary writing pad at her waist and her right hand moved to mimic the writing. As I recall, she mentioned 39 different drafts. Sure enough, I was last in line. Perfect. Don't start at the beginning of a tale, start at the place you can "see" best--that's bursting out of your mind. When stuck, focus on the form of sentences. Write a bunch of 10-word sentences, or write to the rhythm of a song you like. "Emphasize revision," she told me. Then she repeated it--her writing hand waving involuntarily in the air as I had seen it before--"Revision. Revision." I know she said that because I wrote it down in the back of my copy of Fates & Furies, which she kindly autographed for me. See what I mean about the value of being at the end of the line at book signings. I'm haunted by my encounter with Groff. I swear, whenever I hear the word, "revision," now, I see her writing hand moving around and around on an imaginary writing pad! 1. Getting students to revise is harder than getting them to write. I have a file cabinet full of writing prompts that can get pencils moving across the page, but while I have assigned revision as part of a grade for major works, I seldom see much more than corrected grammar, an added paragraph, or other superficial change. Revision has been more of checking off a box than making constructive change. 2. Poetry, the genre that requires the most attention to detail, also happens to be the mode of writing that encourages the least revision. This isn't right. 3. I began to look for a list. 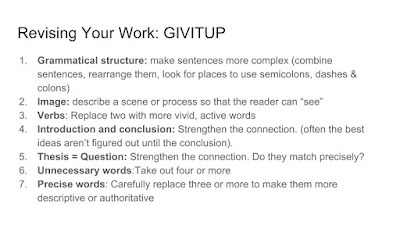 What if there were a set of assigned revisions that could inspire student writers to re-imagine and re-construct their works instead of settling for minor edits an incrimental improvement. That's where Reading Reconsidered arrived to help me find answers to the issues that Groff had raised. Lemov, Driggs and Woolway devote an entire sub-module, 4.2, to issues related to revision. They have a few prominent authors on their side, too. After quoting Vladimir Nabokov--"I have rewritten--often several times--every word I have ever published. My pencils outlive their erasers"--the authors insist on the importance or revision: "The best writers are never done; for them writing and revising are constant partners and often indistinguishable. Interestingly, though, our approach to revision in the classroom is more limited." They go on to describe the typical drafting process: the student writes, waits for feedback, then writes again. 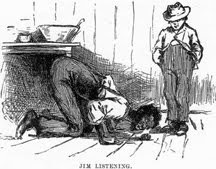 Instead of delineating this process, Lemov, Driggs and Woolway argue instead for "impromptu revisers" who can ask questions and revise as they compose--in much the same way I might re-work this blog as I write it. Use specific nouns (p 240 in the galley I read). I have a link to this on my web site. I plan to turn it into a poster. After our last essay, I asked students to make a plan for revision. 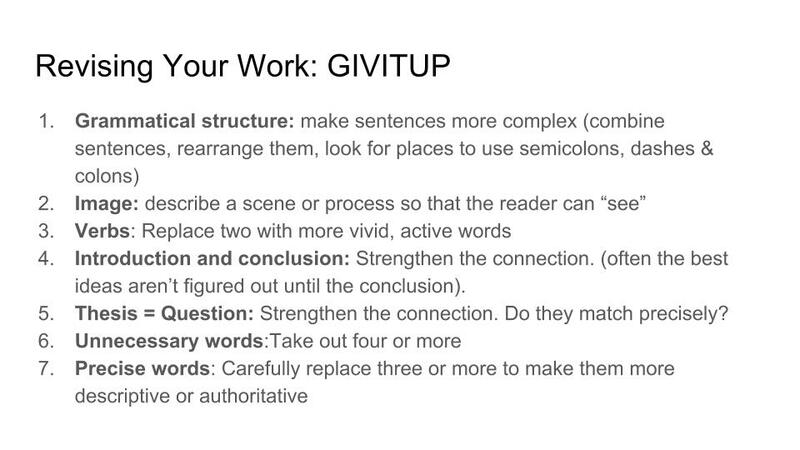 They already had comments from me on their first drafts, but I wanted them to add elements of GIVITUP. These comments led to richer discussion of their writing and better self-assessment. The more I think about it, the more I believe that students shouldn't have to wait on a teacher to begin revision. In less than a month, students will be writing essays for their state exam. I don't want them to turn in these essays without revision, do I? I wonder how many score points are lost due to this significant step. I'm hoping that GIVITUP might give them questions to ask themselves before they submit papers for others to read. I didn't begin the search for better strategies of teaching revision as an ELA teacher. I was wearing the hat of a creative writing teacher, hanging out with one of America's best novelists. I'm left to wonder what a list of revision strategies would look like in a creative writing class would look like. Image and Verbs would certainly make the cut. So would Unnecessary words and Precise words. But writers also need to be able to see a scene from different characters' perspectives, to be able to enhance conflict or write the scene in a different mode. I'd love some suggestions for a creative writing revision list. I have five months to figure one out.